So I’ve barely been updating this blog at all over the last year or so, but obviously I’ve been eating things. So here you go: the first part of my (maybe) multi-part round-up of some of the more noteworthy things I’ve eaten in the last several months. When I visited this place the owner seemed to be the only one manning the restaurant and cooking the food, as he’d go in the back and disappear for long stretches, and I never saw anyone else. He certainly talked a big game, espousing at length the lost art of classic Southern low-and-slow barbecue cookery. He was so serious about it that it made me more excited to try the food; he really seemed to know his stuff. The discrepancy between the way he talked about the food and the actual flavour was almost comical. 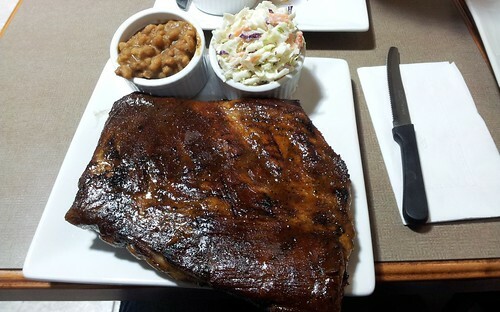 I ordered the spare ribs, and they were ridiculously tough. Fall-off-the-bone is actually not a desirable trait among BBQ aficionados, with a little bit more chew and texture being desirable. This, however, was on the opposite end of the spectrum. Cutting through it, even with the sharp steak knife provided, took a very concerted effort, and biting off chunks of meat was a serious jaw workout. It also had very little smoke flavour, and no visible smoke ring whatsoever. My dining companion had a pulled pork sandwich, and that was even worse. Zero smoke flavour. It had that distinctively gamy taste that you only get when you reheat pork one time too many, and it was absolutely doused in a strongly vinegary BBQ sauce. My dining companion described it as tasting like a vinegar sandwich, and I can’t say I disagree. This was my second time eating at this gem of a restaurant, and having ordered something a bit more familiar the first time (the goulash-stuffed potato pancake — which is absolutely delicious, by the by) I decided to go with the much more mysterious Pulpety, which is described as “Minced chicken balls topped with a creamy dill sauce.” I wasn’t entirely sure what this was going to be, but as it turned out it was essentially meatballs with gravy; kinda like a Polish (and much, much more delicious) take on Ikea’s trademark dish. 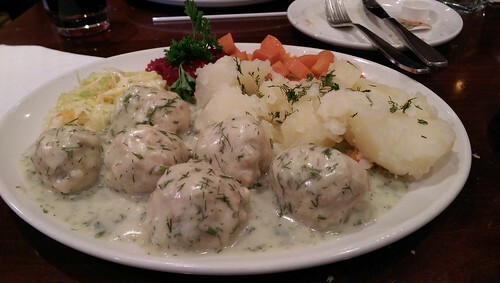 The meatballs were super tender, with a pronounced chickeny flavour, and the creamy, dill-infused sauce complimented them perfectly. It’s very easy to miss this place, which is in a tiny little food court on Queen Street near John. 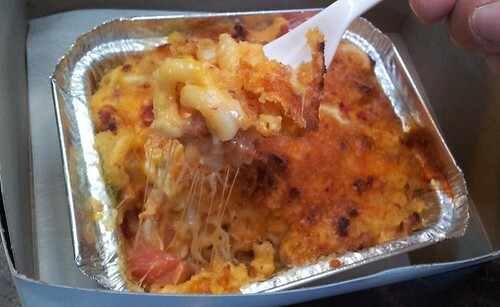 They make a few different mac and cheese variations, which they cook fresh in the oven in front of you, which gives you that nicely crispy, cheesy topping. It’s certainly not gourmet (the mac has a processed-tasting, Velveeta-esque base), but it’s creamy and cheesy and abundantly satisfying. 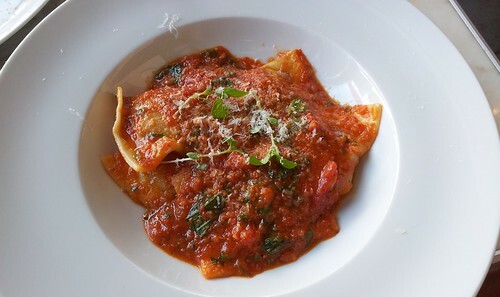 That would be Nonna McEwan’s Ravioli: “veal, pork, beef, tomato sauce and reggiano.” Honestly it’s been a while since I’ve eaten this one, and my memory is getting a bit fuzzy — I do remember, however, thinking it was one of the best versions of ravioli that I’ve had in a long, long time, so I’d say it’s definitely worth eating. Actually, I kind of want to eat it again. Note to self: go back to Fabbrica. Having really, really enjoyed my meal at Lisa Marie, I was excited to try the food from where it all started. 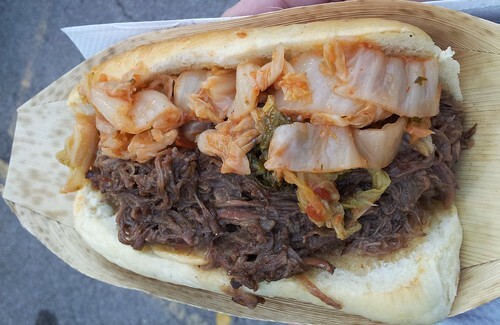 I tried the root beer braised short rib and kimchi sandwich, which certainly sounded interesting. Sadly, it was quite terrible: mushy, cloyingly sweet short rib with the approximate texture of wet paper towels, topped seemingly randomly with kimchi (it didn’t compliment the meat at all). It’s all on a soft, squishy bun that adds no texture and only serves to make the mushy meat feel even mushier. I had the porchetta sandwich, which was okay — it had a decent flavour, though to be honest it’s hard to eat porchetta in this city, knowing that the always phenomenal Porchetta and Co. is an option. 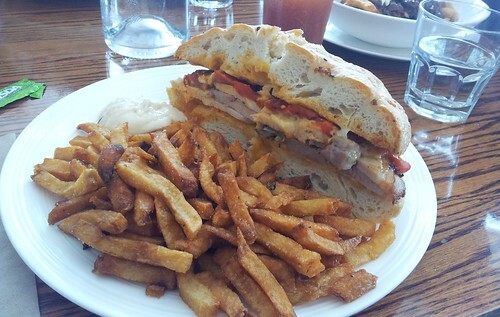 That’s pretty much porchetta perfection, so it’s very difficult to measure up to that. Jamie Kennedy’s famous fries were as delicious as always, however.